Havant’s Celebration of Volunteering for 2019! The awards will recognise the time and energy given by volunteers to organisations across the district. Any group or organisation operating in the voluntary and community sector in the Borough of Havant can make nominations. 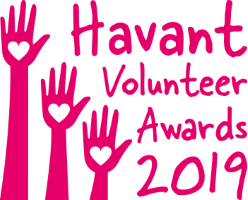 Any group or organisation operating in the voluntary and community sector in the Havant Borough can nominate volunteers. We particularly welcome nominations from organisations who have not taken part in this event before. There are 6 awards categories with 3 volunteers receiving an award in each category. In total there will be 18 award winners. Any volunteer within your organisation who meets the criteria. When thinking about who to nominate don’t forget your trustees, committee members, young people and volunteers who help out at sports and social clubs. We would like to ensure that as many organisations as possible have the opportunity to nominate their volunteers, so we would ask you to select a maximum of 3 volunteers per category, unless you are nominating a team. Please note you can nominate a volunteer for more than 1 category. The top 3 shortlisted volunteers nominated for an award in each category will receive a certificate at the awards evening. Follow the link below and complete a separate form for each volunteer (unless it is a team nomination) you wish to nominate. Please submit your forms by no later than 5.00 pm on Tuesday 16th April 2019.